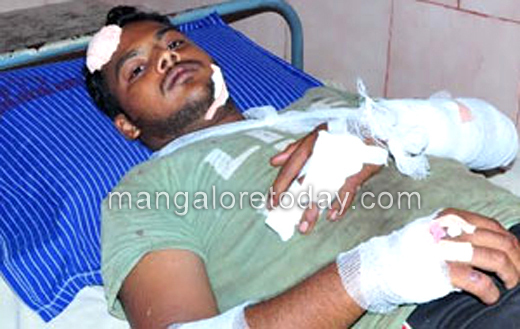 Mangaluru, July 14, 2016: A group of three youth which barged into a beef stall at Mastikatte near Ullal on July 13, Wednesday has grievously assaulted an employee, reportedly with the intention of eliminating him. The injured Kamaludddin (25) has been hospitalised. It is learnt that the assailants were armed with rods, knives and soda bottles. They have been identified as Jaffer, Mitha Nisar and Arfan. Nearly a month ago, the trio along with another person named Mukhtar had entered the same stall and had robbed Rs 12000 after assaulting Kamaluddin during the month of Ramzan. Following Kamaluddin’s police complaint one of the accused namely Mukhtar was arrested and lodged in jail. It is believed that his other three accomplices who were infuriated over this were pressurising Kamaluddin to withdraw his complaint. Even Arfan’s father Jaldi Siddique had reportedly telephoned Kamaluddin to threaten him. However, as Kamaluddin did not yield to the demand the three had chosen to attack him once again. Meanwhile when the three accused along with Siddique were spotted near the hospital where Kamaluddin was admitted, the locals chased them and managed to nab Siddique and handed him over to the police. It is said Siddique was a drug peddler who used to engage youth to sell ganja to students.